The EUP7907 is a high current, low dropout linear regulator with fast transient response and high PSRR. It offers high output accuracy, extremely low dropout voltage, low quiescent current and fast start-up time. The EUP7907 is designed to work with low-ESR ceramic capacitor, reducing the amount of the PCB area necessary for power applications. Only a 2.2μF ceramic capacitor can make the device stable over the whole load range. 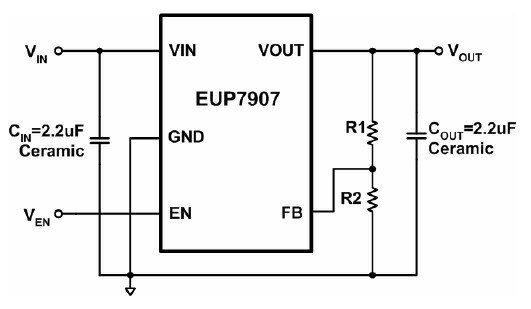 When EUP7907 detects fault signal, such as over-temperature, it will turn off the pass transistor and discharge VOUT to GND from the internal resistor. The EUP7907 works at ADJ mode. When FB pin is connected to two external resistors divider, its output can be adjusted from 0.8V to 5V. Other key features include over-current protection, thermal shutdown. The device can be available in the SOT23-5 package.